Join us for our third event in the 2018 Lunch and Lead Speaker Series! Edward Escudero is President and CEO of High Desert Capital, LLC, a finance company that specializes in providing capital alternatives to small and mid-size companies. Until 2013, Mr. Escudero was the Executive Vice-President and CFO of C&R Distributing, a major distributor of fuel and lubricants and owner of various convenience stores in West Texas and Southern New Mexico. He previously served as the Secretary and CFO of Petro Stopping Centers, L.P. During his tenure at Petro, Mr. Escudero helped to double the company’s annual revenue to more than $2 billion, grow its workforce by nearly 1,000 and expand to locations in over 34 states. Ed currently serves on the board of several area organizations, including El Paso Electric Company, the Medical Center of the Americas Foundation, WestStar Bank, the Hospitals of Providence Trans Mountain Campus, the El Paso Hispanic Chamber of Commerce, and the Trellis Company. Ed has received several awards, including the UTEP Golden Nugget Award in 2012 and the El Paso Community Spirit Award in 2015. Mr. Escudero received his B.B.A. in Accounting from the University of Texas at El Paso. 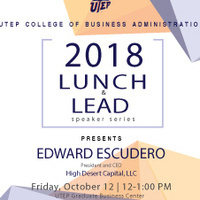 Confirm your attendance and purchase lunch through the MBA Store at mba.utep.edu (Deadline: Oct. 10) Parking included. This event is open to the community. Please feel free to share this invitation with a friend or colleague. We hope you will join us for this great professional development and networking opportunity!